Have you ever went cruisn’ with your friend? Chato won a cruise for two. 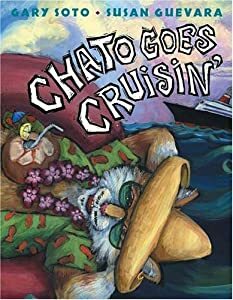 In Chato Goes Cruisin‘ by Gary Soto, Chato asked his friend Novio Boy to go on a trip on a ship. But there were too many dogs on the ship. There were mice too. Chato and Novia Boy were bored because they played dog games on the ship. The dogs ate and played at the same time then the dogs got sick. So Chato and Novia Boy found a ship with cats. Then a wave took Chato and Novia Boy to an island where they found vets for the dogs. Find out what happens next! My favorite part is when Novia Boy says there’s too much agua. I also like this book because cats had to eat dog food. I recommend this book to kid’s in grades K-3 because they will also think it is funny. There are 3 stories about Chato and his friends. I like all three books.